The kitchen is one of the most important rooms in the home. This room is used more often than the living room for grabbing snacks, drinks, and preparing meals. The trend is to create a beautiful room that is inviting as well as functional. Today, more and more homes are building constructed with stone worktops. The main reason stone is the popular choice is that it lasts longer as well as enhances the beauty of the room. Today, the top choices of stone being used in new homes and remodels across the UK include granite, marble, limestone, silestone, Arena stone, Caesar stone, and Quarella. To ensure you choose the right stone that will match with the rest of your décor you will have to pick the right color. Granite colors include black, blue, brown, green, grey, pink, red, white, and yellow. Marble colors include beige, black, blue, brown, green, grey, pink, red, white, and yellow. Limestone colors are beige, green, and grey. Silestone colors include beige, black, blue, green, grey, orange, red, white, and yellow. Caesar stone colors include beige, black, blue, brown, green, grey, orange, red, and white. Quarella colors are beige, black, grey, and white. Granite is the most popular stone used for kitchen worktops offering a sleek look that is very durable. Marble is not used as often as kitchen worktops but can create a very beautiful touch to your kitchen if you desire. Marble is seen more often in bathrooms instead of kitchens, as it is more porous and will need more care in the kitchen. Limestone is more often used around fireplaces or for bathroom or hallway floors instead of kitchen worktops. 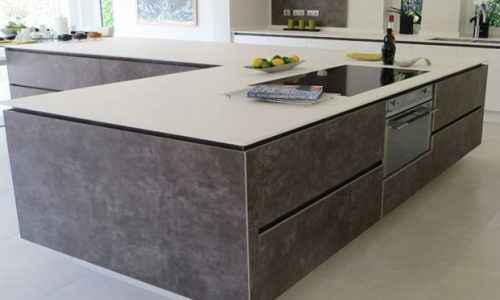 You can use limestone for your kitchen worktop but you will need to care for it properly to ensure it does not become damaged. Silestone is a slick and beautiful stone that is just now being introduced to the consumer often seen in on the floors of supermarkets. However, as a kitchen worktop the stone will create a beautiful and appealing touch that you will absolutely love. Caesar stone is seen as kitchen worktops, vanities, and backsplashes. Quarella can be used for any room. One thing to remember is that no matter which stone you choose for kitchen worktops, the colours stated above are only examples. There are several variations under each color. If you want a blue kitchen worktop, you will have ten different shades of blue to choose from which include Volga blue, vizag blue, Samantha blue, Labrador blue pearl Tfv, Labrador blue pearl Gt, bros blue, blue eyes, azul platino, azul macaubas, and azul bahia. The best way to choose the colour and stone for kitchen worktops is first look around your kitchen and decide which colour will enhance the beauty of the room. You will need to look at the colour of your appliances, your woodwork, and the floor. Once you have a few colours in mind, it will be easy to shop for the best stone and colour for kitchen worktops.